The companions of Saint Nicholas are a group of closely related figures who accompany St. Nicholas in German-speaking Europe and more widely throughout the territories formerly in the Holy Roman Empire. These characters act as a foil to the benevolent Christmas gift-bringer, threatening to thrash or abduct disobedient children. Jacob Grimm (in Deutsche Mythologie) associated this character with the pre-Christian house spirit (kobold, elf) which could be benevolent or malicious, but whose mischievous side was emphasized after Christianization. Knecht Ruprecht is St. Nicholas' most familiar attendant in Germany. According to some stories, Ruprecht began as a farmhand; in others, he is a wild foundling whom St. Nicholas raises from childhood. Ruprecht wears a black or brown robe with a pointed hood. Sometimes he walks with a limp, because of a childhood injury. He can be seen carrying a long staff and a bag of ashes, and on occasion wears little bells on his clothes. Sometimes he rides on a white horse, and sometimes he is accompanied by fairies or men with blackened faces dressed as old women. According to Alexander Tille, Knecht Ruprecht originally represented an archetypal manservant, "and has exactly as much individuality of social rank and as little personal individuality as the Junker Hanns and the Bauer Michel, the characters representative of country nobility and peasantry respectively." Tille also states that Knecht Ruprecht originally had no connection with Christmastime. Ruprecht was a common name for the Devil in Germany,:82 and Grimm states that "Robin Goodfellow is the same home-sprite whom we in Germany call Knecht Ruprecht and exhibit to children at Christmas..."
Knecht Ruprecht first appears in written sources in the 17th century, as a figure in a Nuremberg Christmas procession. :155 Samuel Taylor Coleridge encountered Knecht Ruprecht in a 1798 visit to Ratzeburg, a village in northern Germany. According to tradition, Knecht Ruprecht asks children whether they can pray. If they can, they receive apples, nuts, and gingerbread. If they cannot, he beats the children with his bag of ashes. In other (presumably more modern) versions of the story, Knecht Ruprecht gives naughty children gifts such as lumps of coal, sticks, and stones, while well-behaving children receive sweets from Saint Nicholas. He also can be known to give naughty children a switch (stick) in their shoes for their parents to beat them with, instead of candy, fruit and nuts, in the German tradition. 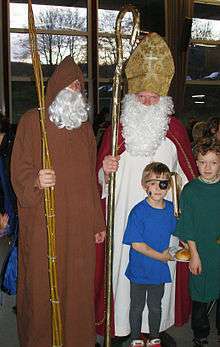 In related folk traditions more closely associated with certain regions of High-Alpine Europe, particularly the snowy villages south and west of Salzburg in Austria, the Knecht Ruprecht character functions as St. Nicholas' assistant, rather than as the primary actor in the early December rituals; keeping a watchful eye on the benevolent saint during his journey. Both are, in turn, accompanied in these regions by an assortment of terrifying horned, goat-like creatures known as the "Krampus", who seek out and terrorize misbehaving children identified by St. Nicholas for punishment. Austrian children grow up believing the worst offenders are whipped with birch switches, and sometimes stuffed in a burlap sack and thrown into an icy river for their bad deeds! In the Mittelmark Knecht Ruprecht is known as De hêle Christ (“The Holy Christ”). He was also known as Hans Ruprecht, Rumpknecht, and in Mecklenburg, was called Rû Clås (Rough Nicholas). In the Altmark and in East Friesland, he was known as Bûr and Bullerclås. In 1862 German poet/novelist Theodore Storm wrote the poem "Knecht Ruprecht". In the German version of the The Simpsons television show, the family dog is named Knecht Ruprecht rather than Santa's Little Helper. Wikimedia Commons has media related to Knecht Ruprecht. 1 2 3 Phyllis Siefker, Santa Claus, last of the wild men: the origins and evolution of Saint Nicholas, spanning 50,000 years (McFarland, 1997). 1 2 3 4 5 Benjamin Thorpe, Northern mythology: comprising the principal popular traditions and superstitions of Scandinavia, north Germany, and the Netherlands (E. Lumley, 1852), 146. 1 2 Alexander Tille, Yule and Christmas: their place in the Germanic year (D. Nutt, 1899), 116. ↑ "Krampus". Monstropedia. 2009-11-05. Retrieved 2012-12-13. ↑ "Devils and maidens: Austria's Krampus parades". Travel.ninemsn.com. Retrieved 2012-12-13. ↑ "Mention of the name "Knecht Ruprecht" in a German "The Simpsons" episode guide".